Mount Prospect police responded about 1:28 pm. Tuesday to the 400 block of North Wille to a report of a burglary. Police received a report that a man who formerly lived at the address on Wille accessed the home through a window. A female was sleeping in the home at the time the offender entered the house through a window. The female came out of the house shouting for a neighbor to call police. The offender was described as a male/black, 6’0″ 170 LBS, wearing a dark shirt and dark jeans. He was last seen running southbound on Wille toward Central Road. Police set up a perimeter in the area. No word on any police contact with the offender. Heavily-armed police were in a standoff in this neighborhood in May 2009; however, there is no confirmation whether today’s case is connected to the offender that was involved in the standoff situation in May 2009. 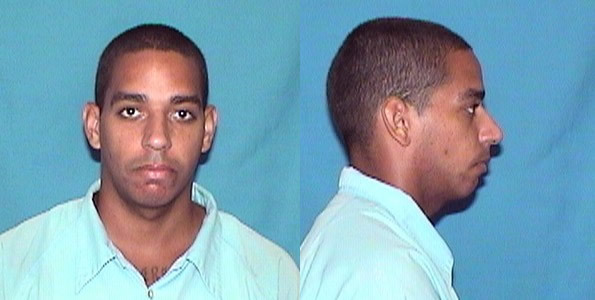 Andrew Hall, who is on probation, and whose last reported address is in the 400 block of North Wille in Mount Prospect, is serving a sentence listed by the Illinois Department of Corrections as “OTHER AMT NARCOTIC SCHED I & II”. The parole date for Andrew Hall was August 9, 2010, and after a sentence of four years, the projected discharge date for Andrew Hall is August 9, 2012. Andrew Hall (Illinois Department of Corrections photos). Andrew Hall was charged with drug-induced homicide in September 2008 related to the death of Gina Dominick, who was found dead in a car in a parking lot behind the Prospect Heights Library in June 2008. Hall was arrested in Chandler, Arizona and held in Maricopa County jail. Hall was later extradited to Mount Prospect, Illinois. He was not convicted of drug-induced homicide.